Florida politicians Bob Rackleff and Adam Putman may be on different sides of the aisle but they certainly can agree on one thing — animal cruelty. Not that it is bad but, as Putnam put it, that "it's for a good cause." 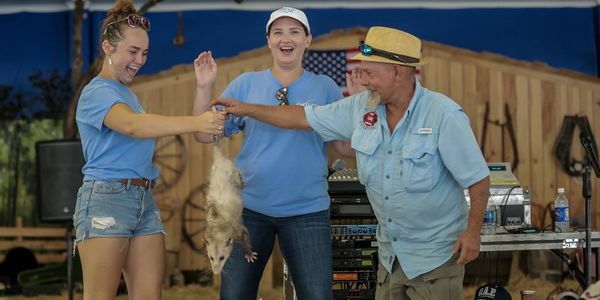 The two both participated in this years Wausau Possum Festival — held earlier this month — where participants got to bid on an opossum after which the winning bidder gets to hold the poor marsupial by the tail and shake it. What is the purpose of this? Beats us, but they claim the festival "celebrates the opossum" and the proceeds go towards the volunteer fire department as well as next year's festival. As World Animal News writes, "When threatened or harmed, opossums open their mouths, displaying 50 sharp teeth as saliva foams around them. This defense mechanism is an involuntary and automatic physiological response to danger." Thus when festival-goers participate in this mind-boggling event they are actively choosing to cause these helpless animals harm and stress. What's more, since the festival is held during the day and the opossum is nocturnal, their whole cycle can be thrown out of whack. Unbelievably, this festival has been around for nearly 50 years. That's 50 years of animal cruelty and 50 years too long. It is time to end this festival once and for all. Please sign the petition and ask Wausau, Florida Mayor Roger D. Hagan to commit to protecting animals by canceling this and all future possum festivals.